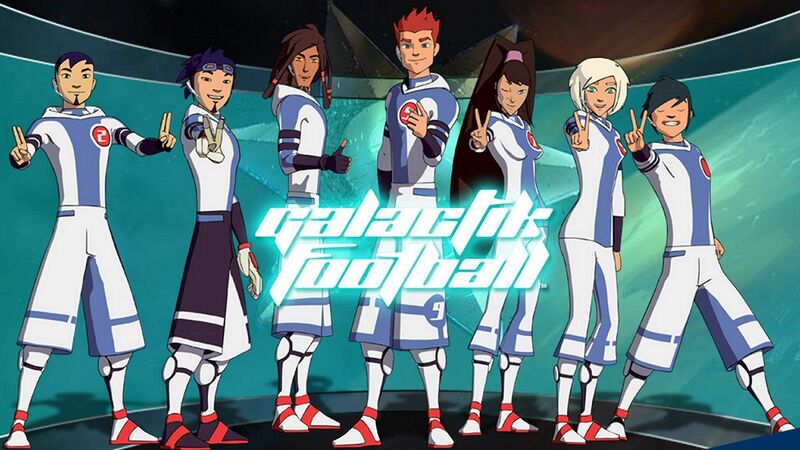 Here's where to watch every episode of Galactik Footbal season 2. Mouseover or tap an episode to see where to stream it. Click or tap the play icon to stream it on the best available service. The Suspension Apr 6, 2008 Rocket saves Tia’s life in Genesis Forest, but to do it, he uses The Breath – a violation of League rules. Yuki becomes the new Snow Kids’ goalkeeper to the joy of Micro-Ice who is smitten with her… After Addim tells Aarch of the illegal use of The Breath, Rocket admits that he did it. Aarch has no choice but to suspend Rocket indefinitely. Rocket doesn’t stick around long. Now D’Jok is sure the Cup is slipping away… But before Rocket can go back to Akillian, Sinedd makes him an interesting offer. Episode 3 Apr 12, 2008 Aarch searches for a replacement for Rocket, but it’s not easy. Rocket is irreplaceable. D’Jok suggests Mark from Akillian to step in. Tia worries about Rocket whom she thinks has returned to Akillian. Sinedd introduces Rocket to Netherball – a dangerous one-on-one football match played inside The Sphere where there are “no rules”. However there seems to be dark powers behind this forbidden sport… including Duke Maddox’s assistant Harris! Aarch asks Artegor for a "friendly" with the Shadows, which pleases Artegor. Clamp thinks he sees General Bleylock, but that’s impossible… Bleylock is dead, isn’t he? Episode 4 Apr 13, 2008 Clamp tells Sonny that he saw Bleylock alive. Sonny doesn’t believe it, but he’s taking no chances. He and his pirates return to Genesis. Aarch makes D’Jok the new captain of the Snow Kids in Rocket’s absence; Tia takes it badly… The “friendly” between the Snow Kids and The Shadows is very unfriendly, both on and off the pitch. D’Jok fights with his teammates taking his new role as captain a bit too far. Episode 5 Apr 19, 2008 The Snow Kids go home to Akillian to surprise Ahito who is there recovering from his illness. The big news is Ahito’s coming back to Genesis with the Snow Kids, but he’s still not ready to play. On Akillian, Clamp has the Snow Kids play against their own clones. Tia visits Norata and Kyra, but Rocket’s not there. He never came to Akillian! But where is he? Norata and Kyra decide to return to Genesis with the team to look for Rocket. Unknown to the others, in the lower levels of Genesis, Rocket tries out Netherball… He’s found his new home in The Sphere. Episode 6 Apr 20, 2008 Back on Genesis, Norata blames Aarch for Rocket’s disappearance. Tia fights with D’Jok because she thinks he doesn’t care about Rocket as he’s too happy being "the new captain". Yuki has doubts about her ability; is she good enough to be a Snow Kid? Micro-Ice takes Yuki to the Luna Genesis amusement park – but Ahito, Thran and Mark crash Micro-Ice’s plans! Rocket plays the Rykers’s star Kernor - the current Netherball champion - in a brutal one-on-one match! Will she remain in The Sphere? Episode 8 Apr 27, 2008 Plunging into the world of Netherball, Rocket plays Woowamboo of the Wambas. Will Rocket keep control of The Sphere? Sonny tells his men they need to find Rocket. Rocket may lead them to Bleylock… if Bleyok is alive. In a hidden lab, Bleylock shows Harris what’s really behind Netherball… they are capturing the players’ powerful flux from The Sphere!! But why? Clamp and Dame Simbai think the "new Snow Kids" are ready for the tournament. It won’t be long now. Episode 9 May 3, 2008 D’Jok continues to have his nightmares… but Micro-Ice assures him he’s just nervous before the All-Stars match. The Snow-Kids watch the match on the Holo-TV: the All-Stars vs. the Technodroids V3s… Luur of the Xenons is very impressive; his flux, the Heat of Xenon is one of the most powerful forces in the galaxy. Aarch - the All-Star team coach - struggles with Sineed, but Warren rallies the team on. D’Jok plays well, but Micro-Ice has doubts about the Snow-Kids’s success in the upcoming matches. Mark and the rest of the team tell him where to go! The young pirate Arty overhears the former Wambas players Wolfen and Zoran talking about Rocket… and something called “Netherball”…What could it be? Episode 10 May 4, 2008 Against the wishes of Bleylock and Harris, Sinedd plays Rocket in a rough match of Netherball. Will Sinedd control The Sphere? After the match Warren tries to bring Rocket back "upstairs", but Rocket is happy playing Netherball. Tia is impatient with the League… there’s still no news on Rocket’s suspension. Aarch tells Ahito that he cannot play in the first match; he’s not strong enough. Yuki will have to replace him. The pirates Arty and Bennett follow Wolfen and Zoran into the lower levels of Genesis Stadium… where they discover the dark world of Netherball and Rocket!! Sonny is sure that Technoid is behind it…and maybe even Bleylock! Episode 11 May 10, 2008 Yuki has a "goalkeeper nightmare". She tells Mark that she’s worried about today’s match against the Wambas. Tia’s father informs his daughter that Rocket never left Genesis Stadium. But where is he? Harris sneaks into Addim’s office and places a video file on her computer to keep Rocket playing Netherball. The League votes to delay Rocket’s return to the GFC thanks to Harris! Sonny and Corso inspect The Sphere, but find no clues to its true function. Early in the match with the Wambas, the Snow Kids are losing… Could the Snow Kids be eliminated in their first match!! Episode 12 May 11, 2008 The Snow Kids are trailing the Wambas at the half, and the team is very depressed. Especially D’Jok. It looks bad for our champions. Suddenly Ahito comes back and subs for Yuki in the second half! Aarch pushes the Snow Kids to "win the match for Ahito". Can the Snow Kids turn it around with Ahito in goal? While searching the League’s computers Arty spots the fake video file about Rocket in Addim’s computer – Sonny is very interested…so is Addim. Addim tells Aarch that Rocket will not be suspended and can play in the tournament again…but where is he? Mark has a secret, but he’s too afraid to tell anyone… he knows where Rocket is. Episode 13 May 17, 2008 Mark tells Aarch and the team about Rocket and Netherball. The Snow Kids are shocked. Sonny and his pirates meet with Clamp and tell him about The Sphere. Clamp thinks the flux could be invisible… but how and why? The Shadows/Technoid match begins… and Sinedd is a force of nature. He’s never played so well, despite playing with a Netherball injury. Bleylock orders his robots in a spacecraft to fire a flux device at the Shadows planet causing a huge explosion! On the pitch at Genesis, the Shadows suddenly lose their flux, the Smog!! The Pirates easily beat the Shadows 7-2. Sonny smells trouble… he and Corso leave Genesis Stadium immediately, but the Technoid robots arrest them in the Astroport! Sonny’s a wanted man, again. Mark takes the Snow Kids to The Sphere to see Rocket… Tia is speechless. Could that really be Rocket? Episode 14 Jul 26, 2008 Sonny and Corso escape arrest by Technoid’s robots thanks to Arty and Bennett’s clever trick. The pirates blast away from Genesis aboard the Black Manta just in time... But Sonny and his gang are blamed for the explosion on the Shadows planet, and the Pirates GF team is disqualified. Artegor falls ill due to the lack of the Smog; Aarch takes him to Dame Simbai for treatment. Rocket plays Luur in Netherball in a wicked obstacle match. The Snow Kids are shocked to see "the new Rocket"…especially Tia. He’s a different person. D’Jok tells Rocket that he can play GF again, but Rocket tells him he’s never coming back. Tia is devastated. Bleylock and Harris are thrilled that Sonny Blackbones is on the run again… but why are they still collecting the flux? Episode 15 Jul 27, 2008 Aarch is amazed to hear Rocket isn’t coming back to the Snow Kids. He sends D’Jok and Mark down to convince him. Tia discovers that Technoid is holding her parents prisoners as they were witnesses to the Shadows planet explosion. Mei promises to help… she introduces Tia to her special friend - Corso! Sonny meets with D’Jok to assure him of his innocence. D’Jok believes him. The Xenons and the Cyclops play in the quarterfinals. Luur uses his flux, the Heat of Xenon to deadly results. Sonny agrees to help Tia on one condition – her parents must tell the galaxy of his innocence. Tia is fine with that, but she’s coming along with the pirates, or it’s no deal! Episode 16 Aug 2, 2008 Micro-Ice has a nightmare about playing in Genesis Stadium… Clamp contacts Sonny aboard the Black Manta. Dame Simbai informs him that the explosion on the Shadows planet was a flux device! Sonny now knows what’s behind Netherball. The Sphere is the key… Bleylock is mixing the players’s flux… creating a powerful weapon. Aarch announces the new assistant coach for the Snow Kids – Artegor Nexus! Artegor quickly whips the Snow Kids into shape by putting Yuki in Tia’s vacant position. Artegor and D’Jok are not friends, but Artegor does seem to want to help the captain of the Snow Kids. In space, Tia, Sonny and his gang approach the Technoid prison barge…but how will they get in? Episode 17 Aug 3, 2008 Tia is taken prisoner with Sonny and his pirates aboard the Technoid prison barge. She spots her parents in a nearby cell – but how will Tia rescue them and herself? The Snow Kids play the Rykers in the quarterfinals match, but Rocket has not come back and Tia is with the pirates! Luckily Yuki and Mark fill in, but will they be enough to beat the mighty Rykers? Episode 18 Aug 9, 2008 Rocket still has not returned to the Snow Kids, and Aarch is worried. D’Jok competes in the Big Kicks Challenge in Genesis Stadium with Warren, Luur, Lun-Zaera and other GF stars. Suddenly a familiar voice booms from the Genesis Stadium screens – it’s Sonny! The pirates hack into the Holo-TV network to broadcast a special report of their own! Tia returns to the Snow Kids after her successful rescue mission with the pirates. Sonny and Clamp tap into The Sphere and discover that it siphons off the players’s flux giving Bleylock limitless power!! D’Jok and Mark (and secretly Tia) go back down to watch Warren play Rocket in a brutal Netherball match with obstacles… Can Warren beat Rocket and get him out of The Sphere for good? Episode 20 Aug 16, 2008 Tia bravely enters the Netherball Sphere to play Rocket… but Rocket’s too far gone. He’s too wrapped up in the sport to know it’s even her. He’s seeing things. Rocket plays harder than ever. Can Rocket be beaten? Will Tia survive the match? Arty and Bennett follow Sinedd to Bleylock’s hideout, but will they finally trap Bleylock? Aarch welcomes Rocket back to team, but not very warmly. The Snow Kids haze Rocket a bit… but everyone is very happy to see him. Is Rocket really himself again? Will Tia ever forgive him? Episode 21 Aug 17, 2008 The Snow Kids are thrilled to have Rocket back, but Rocket is shocked to see Artegor coaching. In the holotrainer, it’s clear that Rocket’s not ready to play with the team; he plays too selfishly. After the Shadow’s flux, the Smog, returns, Artegor gets his wish: The Shadow play the Xenons in their semifinals match. Sinedd shows signs of illness from the Smog… Can Artegor and Sinedd beat the invincible Xenons? Episode 22 Aug 23, 2008 Against Maya’s wishes, D’Jok plays in the Snow Kids semifinals match with the Lightnings. But on the pitch, Ahito falters… could he still be sick? As halftime approaches the Snow Kids are trailing. Aarch is not sure that his team wants to win. Deep inside of Genesis, Harris visits a Technoid vault and removes the flux devices… but why? Episode 23 Aug 24, 2008 It’s the second half of the semifinals match between the Snow Kids and the Lightnings…and the Snow Kids are losing, 2-nil. Rocket rallies the team to everyone’s surprise, and thanks to D’Jok’s great idea, the Snow Kids fight back. However, Ahito continues to hide his illness, and insists on playing. Can the Snow Kids beat the amazing Lightnings and advance to the finals? Episode 25 Aug 31, 2008 Cup finals fever has hit Genesis Stadium. Despite the Snow Kids being the current champions, the odds are on the Xenons and their power flux, the Heat of Xenon. But no one expects the stunt Luur pulls on the pitch at Genesis! Can the Snow Kids focus on the match and not on Luur’s game? Meanwhile, Arty and Bennett find Bleylock but lose the flux devices… in Luna Genesis!! Will Bennett find the flux devices and stop the total destruction of Genesis Stadium? Episode 26 Sep 6, 2008 Snow Kids play the second half time against Xenons. D'Jok manages to tie the result to 2:2. Meanwhile, Sonny, Corso and Artie chase Bleylock. Bleylock sends an army of Technoids to distract them while he gets into the spaceship from which he is going to fire the flux devices and destroy Genesis. However, Sonny shot the ropes holding a giant block, which fell down and destroyed all Technoids. Sonny, Corso and Artie get onto the pirate ship which chases Bleylock's ship. They try to shoot down Bleylock's ship using lasers, but the ship is equipped with shields. However, when Bleylock tries to fire the flux devices, he realizes that his assistant Harris betrayed him by blocking the flux devices and planting a bomb into the ship. The bomb explodes and destroys Bleylock, but the flux devices created a huge explosion which destroyed the pitch on the Genesis. D'Jok's nightmare comes true when he falls from the edge of the destroyed pitch, but Luur saves his life. Since it's a draw and they can't continue to play on the half-destroyed pitch, they decide to play the penalty shootout. While defending a Xenon player's shot, Yuki breaks her leg, so Ahito has to take her place as the goalkeeper. Luckily, he manages to defend Luur's shot. Rocket scored the winning goal, and Snow Kids have once again won the cup. At the end, Harris is shown, placing a flux device into the Technoid office, saying to the flux device that one day they will rule the galaxy.